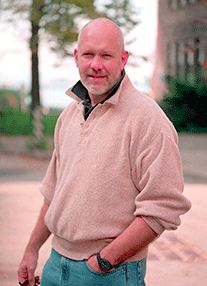 Thomas Reid Pearson is an American writer born in 1956 in Winston-Salem, North Carolina. Pearson was a student at North Carolina State University, where he earned a B.A. and M.A. in English. He went on to teach at Peace College in Raleigh, North Carolina. He started work on a Ph.D. in Pennsylvania but soon returned to North Carolina, where he worked as a carpenter and a housepainter while he began writing his first two novels, A Short History of a Small Place and Off for the Sweet Hereafter. Neither was published until 1985, when he moved to New York City, where both books were issued by Linden Press. His novels are set in the South, in the imaginary small town of Neely, near Winston–Salem, or, in his recent novels, in the Appalachian areas of Virginia, where he now lives. His writing captures a uniquely Southern social order, outlook, and voice and has been compared to the work of Mark Twain and William Faulkner. Perhaps most notable in Pearson’s style is his writing as if he were capturing a back-porch discussion of events, which leads to long sentences and paragraphs. His vivid humor is woven throughout his writing. A Short History of a Small Place, Off for the Sweet Hereafter, The Last of How It Was, Cry Me a River, Polar and Blue Ridge were New York Times Notable Books. Pearson also collaborated with John Grisham on early drafts of the screenplays for The Rainmaker (1997) and Runaway Jury (1998), films based on two of Grisham’s novels. Pearson is married and lives in Virginia.